I love this series. This was from the POV of Gabriel Garret and I so love him. This writer is so good, the series is well written, he knows his weapons and military strategy. It is also about love and Gabe surrendering to it, realizing he has to trust to love and that his very life depends on the love from his woman. So it is about fighting the zombies, yes, a bit, but the true enemy is man. Men who are greedy, evil, cruel and just plain desperate. This is the best of the post apocalyptic zombie reads. The characters are well drawn, the obstacles and struggles and how they are resolved are also well done. If you like well written stories with characters you care about written by an author who knows his combat stuff, this is the book for you.Now I will read The Passage. Great survival series.Live this book and this whole series. I did feel like I was missing Eric in this one, but it was a nice change of general perspective. Overall great read, and one of the best apocalypse book series I have read. Liked itI liked this a little less than the first books: I can't really say why though. It was good but it seemed to be just dragged out, may be to add another book to the series? It seemed to me that the writing was a little bit different. Caleb Hicks was almost always described or mentioned in an odd manner: Hicks was kind enough to detach his tactical light for me to see, not an exact quote. Well I would hope he'd be kind enough, Gabe was treating his bullet wound. It was just one example of how Hicks was written. And during the wound care after all the noise of the final fight why was there no worry of the infected?The typos were numerous, editing seemed less in this than the previous books. I have been reading these one after another: I wouldn't be doing that if I didn't really enjoy the story as a whole as well as the characters. I am moving on to the next one right away.It's a good story, well done, attention to detail of the tactics, the characters are well developed. You can tell that when you find yourself worrying about them making it through one crises after another. The lead character to my mind is Gabe, then Eric. They are the heroes of the story. Heroes should be larger than life and capable of many things that a real human may not endure in a Zombie Apocalypse.I highly recommend the series. I loved the other Surviving the Dead books and was very excited when this one came out. There was just something about this one that lacked some of the other books' appeal. Maybe it's because the characters are settling into a more "normal" way of life. They have a town, restaurants, stores, and fewer everyday zombie problems. It was also strange to me that someone from Gabe's past shows up after all this time and after so many other people have died. That whole aspect of the story-line would have been great if I hadn't been reading a zombie apocalypse book. The story did pick up for me a little more than half-way through and seemed more like his previous books in the series. There is no denying that Cook is a very good writer and story-teller. It's obvious he cares about his craft and puts a lot of work into it. I'm still a big fan and look forward to seeing what comes next for him in his writing career! I just wrote a review for the first book in the series, and now I have to admit that I was hooked enough by the story line to buy most of the remaining books. However, this is it. The premise of the 'bad guy' in this book is ridiculous. With any good apocalypse book, you have to be willing to suspend disbelief to a degree, but this book goes so far out on a limb that I couldn't make my imagination stretch that far. Because the writing and editing were both under par for all of the books, their only saving grace was the interesting story line. Even that wasn't evident in this book. There are just too many great books out there for me to spend my money on any more of these. To Mr. Cook - if you read these reviews - PLEASE hire an editor! i love this series by James Cook, he really gets a lot going on in the story!! i love his unique detail to his characters. i would like to see more guests show up from previous stories, such as Gabe (spoiler alert), saved a family i would've liked to see them at the end. all in all Mr. Cook, went above and beyond for the story and took it up a notch, w/action-i believe. The only thing that i didn't care about was i felt like there were several times Gabe made errors; now the reason this bothered me was after the first one he said he would be more careful, i know that options were limited but i guess i have to much faith in Gabe, to believe him to make so many mistakes..... All in all this was another great installment of the series!! A must read, for anyone who loves this series!!! The twisting, turning storyline continues. After that left field romp through book four and the cognizant zombie, we revisit Gabriel and Eric. Some time (a year?) after book three and the defeat of the Free Legion we find Gabe and Eric trying to live a peaceful and somewhat normal life. The zombies are still out and about, but they play second string to the character plot. Gabe's black ops past prior to the Outbreak come back to haunt him and threaten all he has built in Hollow Rock. Old South American vendettas seemingly long forgotten rear their ugly head and threaten to separate Gabe from his! An excellent story with great characters. This book seems to have an ending, but it wouldn't surprise me if Mr. Cook squeezes another novel out of this series. This is an okay follow-up to the rest of the series but where did the zombies go? This one is mostly Rambo military man vs kingpen bad guy after the world ends - which isn't bad but this author has written very creepy zombie action and tingled my spine in the past so I was a little disappointed. This series may have run its course. If you have read the rest of the series then this one is worth your time but I may or may not start the next one (if there is one.) Let's just say I'm not chomping for a follow-up. This book is entirely focused on Gabriel, and gives some extended insight into his backstory. No matter what the author does to these people, they still stand strong. It being hordes of thousands of zombies, attacks from marauders - or sniping from Gabriels old enemies.I maintain that this is one of the best dystopians serials out there, and this is perhaps the best of the books yet - but it's still painfully two-dimentional, full of weird choices - and superhuman strength in the few survivors - both physically and mentally. 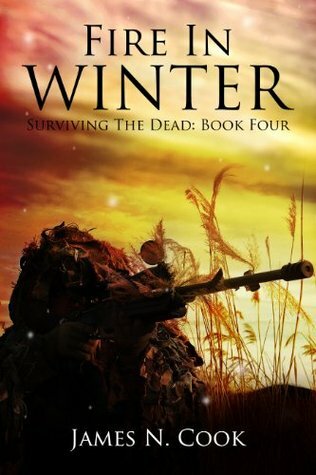 The good the bad and the ZombiesThe tales of survival got even better in this book 4 - Fire In Winter. Quality entertainment. He even gave us many many more pages to read, very generous. Oh . . The tales he told, engrossing, stimulating, and a encounter with a insanely evil monster that trumps the Zombies. The addition of a Zombie narrating it's thoughts a few times in this series is genius and keeps me wondering - will it return with more to say? Is it a rare creation that kept some of it's past memories? Not was good as the rest....This may be one of those "transition" books, it advances the plot and acts as a bridge to the rest of the series. It's difficult ultra to write a multi part serial and hit a home run all the time. Cook follows a logical post apocalyptic progression, outbreak, reaction, so piety somewhat recovers and is reborn, if a new animal. The fighting at the end is good, the first two thirds of the book didn't engage me, perhaps the Christmas season is too distracting, but I never got one of those meaty can't put it down sequences. I have really enjoyed the series so far, but will probably be stopping after Fire in Winter. I didn't mind having Gabe as the point of view, but as the characters have a more established lifestyle now, it is not longer a survival adventure series. It has become more of a guerrilla combat narrative, which is not something I was looking for. Some folks love this type of novel, and I encourage them to read on!! Book 4 was fantastic as expected and i enjoyed Gabriel's perspective.I think i enjoyed the fact he can lead a man to think he's to be freed, only to put a bullet in his head.Merciless and unforgiving. That's the spirit. This was a good read and the series has been very good overall. This one, however, was not quite as good as the previous 3. Don't get me wrong, it's still good. It just didn't hold my attention like the previous in the series. Excellent readKeeps you reading the whole thing you don't want to put it down. The story keeps you wanting to read more. Another great chapter in the life of Gabe Garrett! Easily the weakest book in the series so far, but I still enjoyed it. Quite good, read all his books except the Passenger (yet), tho not sure about skipping so far ahead into future, feels like missed a book or two? Still a good series, though it was even less zombies than the last book...now, it's mainly people on people violence. James(Jim) Cook keeps the ball rolling and the action hot yet again. More back history as plots unfold. Great series. I burned through them. James N. Cook - James N. Cook (who prefers to be called Jim, even though his wife insists on calling him James) is a martial arts enthusiast, a veteran of the U.S. Navy, a former cubicle dweller, and the author of the Surviving the Dead series. He hikes, he goes camping, he travels a lot, and he has trouble staying in one spot for very long. Even though he is a grown man, he enjoys video games, graphic novels, and gratuitous violence. He lives in North Carolina (for now) with his wife, son, two vicious attack dogs, and a cat that is scarcely aware of his existence.